It is rare for the camshaft to be the cause of what is considered camshaft failure. Each camshaft undergoes strict quality gates throughout the manufacturing process which ensure that the camshaft meets all design requirements. The failure is usually attributed to one (or more) of the following: insufficient lubrication, improper break-in, reusing old/worn components, mechanical interferences, and inferior hardware/hardware not torqued to spec. Always use the camshaft moly paste that is included with your flat tappet camshaft set. It should be applied liberally to every lobe and lifter face of all flat tappet cams. All journals and tappet bores should receive assembly lube on assembly. Roller follower cams do not require the moly paste; however, sufficient assembly lube should be used (see your Camshaft Card for additional information on break-in). Valve train components and camshafts rely on a film of lubricating oil to operate correctly. When this film isn’t present due to lack of oil, incorrect oil, oil breakdown/contamination, or overheating – failures occur. Blown head gaskets are a primary contributor to camshaft failure. A head gasket failure often results in coolant mixing with oil. Once the oil is contaminated, it immediately loses its film strength and ability to lubricate properly. This results in damage to the camshaft and valve train components because the relationship between the cam lobes and tappets becomes metal-on-metal contact. The film of lubricating oil that is required between these parts is lost because of the contamination. Detailed break-in instructions can be found on the Camshaft Card provided with each camshaft set. These instructions should be read and followed carefully. It is important to always replace tappets when installing a new set of flat tappet cams. Because flat tappets ride directly on the cam lobe, they become mated to that specific lobe/camshaft. The increased lift on your aftermarket camshafts results in a larger contact patch on the tappet. When you reuse your old tappets (which are mated to the OEM camshafts) with your aftermarket camshafts, it often results in failure. 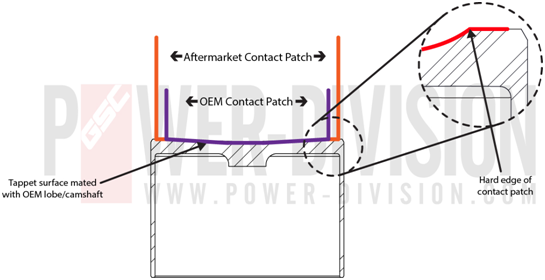 This is because the larger profile lobe is now riding on what is essentially a hard edge produced by the perimeter of the contact patch on the surface of your old tappet. Just as important as replacing used tappets is replacing old springs. With the increased lift of aftermarket camshafts, the range that the spring is compressed is increased as well. Your old springs have been operating in the range that they were with your OEM camshafts. When you install an aftermarket camshaft and the compressed range increases, new stresses are introduced to your used spring. This doesn’t mean that NEW OEM springs cannot be used for some applications, but it does mean that you shouldn’t use OLD OEM springs with your aftermarket camshafts. Consider that after 20,000 miles averaging 35 mph (at about 2,500 rpm) your springs have gone through around 100 million cycles. The valve train is full of moving parts that all have to work together in perfect time. If there is an interference preventing the unity required of these moving parts, something is bound to go wrong. The biggest interferences to be mindful of are spring bind, retainer to valve guide seal clearance, valve tappet to head clearance, and lobe to tappet bore clearance. It’s important to check clearances when installing aftermarket camshafts. Always use the hardware supplied by the manufacturer and always follow the torque specs as defined by the manufacturer. When using aftermarket head studs, verify the line bore before installing aftermarket camshafts. There is a common misunderstanding that the dowel pin located at the end of some camshafts drives the camshaft. This pin is used for alignment purposes only – the friction between the shaft and gear is what drives the cam.